Why have you decided to initiate the project? You may know what you want, take time to discover what you need and ensure that everyone else is aligned. In order to be effective during the discovery workshops it is important that everyone involved knows what benefits the organisation needs to realise and the outcomes that management expects to achieve from the capability delivered by the project. The discovery process focuses on gathering information. Starting with the expected benefits that need to be realised and measurable outcomes that need to be achieved. From this base it will be possible to develop an understanding on how the organisation needs to work in the future and how other stakeholders (such as B2B or B2C customers) will interact with the product or service. Then it will be possible to identify the required capability. The output from the Capability Discovery process will be a high level Project Product Description and notes that will be the input to the Blueprint design process. 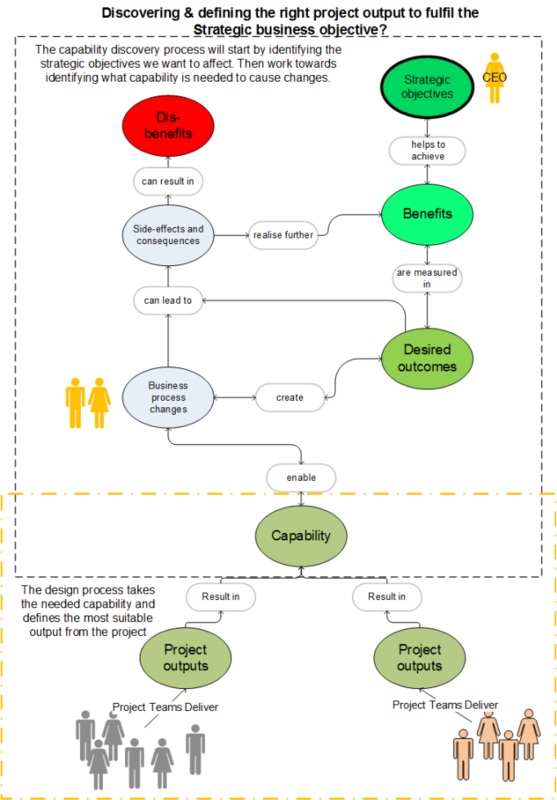 The Blueprint design process then takes the information from the Capability Discovery Process and identifies the outputs that will deliver the capability needed. The discovery process is an important investment and critical to the successful delivery of the project product or service. Discovery is not a one-off exercise; I recommend that you think of using the rolling wave approach, with a fairly comprehensive discovery at the beginning of the project followed by further sessions as required. The trick with discovery is to gather enough information in order to make well informed designs; the challenge is getting the balance right. Every project will be different, here are some guide lines from which you can plan your own discovery. Get the right people involved, and make sure that you have a core team that will remain involved throughout the project. who should be involved in the capability discovery process? How long should the initial discovery process/phase take and what is included? Aim to take around 4 weeks, maybe 6 weeks if it is a complex project , this period with be influenced by the level of customization that is required and the type of contract entered into. The discovery phase can be broken into three sub phases of five days for pre-workshop preparation, 10 to 12 days for discovery workshops followed by 5 days for post workshop clean up. Here is a guide on some of the inputs you can expect for the initial discovery process in management stage 1 of the project. 3. Detailed list of gaps between the functionality that is possible on the platform and functionality needed by the business. For the purpose of this exercise let us assume that the discovery phase will consist of 10 workshops. How you plan these workshops will also depend on whether you are doing a complete custom build or using an existing platform. The assumption here is that an existing platform will be used. The individual objectives for each session, including inputs and outputs. To develop a common view of the customer base, their needs and how the solution needs to support them with content & functionality across the standard range of user journeys. Review & understand the companies market & competitors. Review the Customer Management capabilities which will be brought to bear on the solution. To gain a strong understanding of what different elements and methods are used to create the brand identity and positioning. Explore how the brand should be expressed online and the correct direction to proceed in the new design. Look at the specifics of the payment, order management and delivery process. Understand how the merchandising team plans to maximise sales and what capability they need to do this. Understand how the marketing team plans to promote the brand and business. Understand the custom service needs and define high level needs around customer service. Discuss integration points that will be needed as well as the infrastructure required to support business needs. During the previous workshops the discussion will have been carried out with the intended platform in mind. If a platform has already been selected then use this workshop to confirm what functionality is already included and what needs to be customised in order to meet business needs. If you are facing a situation where there are two options to choose from, say hybris and Epi-Server then you can use this workshop to identify which of these is more suitable. In this process you will confirm what high level functionality is already included and what needs to be customised in order to meet business needs.